What is Lightning Protection Testing? A Lightning Protection Test (LPT) involves all lightning conductors and earth grounding installations being visually inspected and tested by a qualified Electrical Engineer. 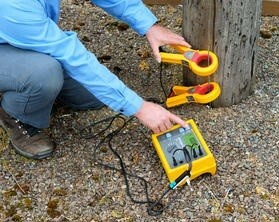 Each individual earth grounding point and its conductors are electronically tested for resistance to ground. Performing random continuity tests, especially continuity of those parts of the Lightning Protection System which were not visible for inspection during the initial installation and are not subsequently available for visual inspection. The resistance to earth of each local earth electrode and, where practical, the resistance to earth of the complete earth termination system. Each local earth electrode should be measured in isolation with the test point between the down conductor and earth electrode in the disconnection position. If the resistance to earth of the earth termination system as a whole exceeds 10ohms, additional electrodes should be installed, where practicable, to obtain the requisite resistance value. If there is a significant increase in the value of the earth resistance from previously measured values, additional investigations should be made to determine the reason for the increase and measures taken to improve the situation. The results of a visual check of all conductors, bonds and joints or their measured electrical continuity. Why Should I have it carried out? The Electricity at Work Regulations 1989 state that lightning protection systems should be tested in accordance with the relevant British Standard. (details below) Also if a building with a poorly maintained system or a defective earth installation is struck by lightning or static electricity this can result in ‘flash-over’ to other metals within or on the structure. This can take place even without a direct strike because all lightning conductors pick up static even if the storm is 4 miles away! How often and when should it be carried out? An LPT should be carried out at maximum intervals of twelve monthly. We suggest that LPT’s are carried out at eleven month intervals to allow us to vary the seasons we test in over time. · Part 4: Electrical and electronic systems within buildings. BS EN 62305-1 provides the general principles to be followed in the protection of structures against lightning, including their installations and contents as well as people. BS EN 62305-2 is applicable to risk assessment for a structure due to lightning flashes. Its purpose is to provide a procedure for the evaluation of such a risk. BS EN 62305-3 provides the requirements for protection of a structure against physical damage by means of a lightning protection system (LPS), and for protection against injury to living beings due to touch and step voltages in the vicinity of an LPS. BS EN 62305-4 provides information for the design, installation and maintenance of lightning electromagnetic impulse (LEMP) protection measures for electrical and electronic systems within structures, able to reduce the risk of permanent failures due to LEMP. 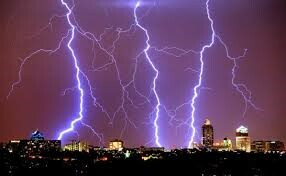 BS EN 62305 lightning protection systems comprise external (structural) and internal (surge protection etc.) components, where previous standards did not. It is now recognised that the electromagnetic effects of lightning related activity, and switching events, are the cause of much damage to systems and equipment, with the subsequent loss of critical data. Surge protection devices (SPDs) were not required previously to comply with older standards. SPDs are required under BS EN 62305; they are part of the internal LPS and are installed firstly to prevent dangerous lightning currents from entering a building via its services, and secondly to reduce the risk of damage to electrical and electronic equipment and critical systems from transient over-voltages.